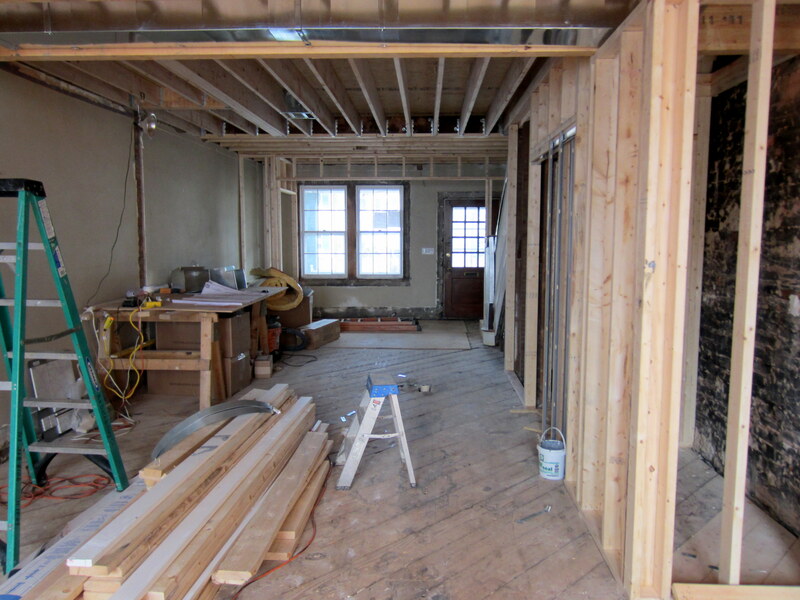 As seen earlier (https://wolfestreetproject.com/2012/03/04/weve-been-framed/), one of the several dramatic steps to our renovation was our reluctant removal of the original second-floor joists across three quarters of the length of the house. The joists were pocketed directly into the brick exterior walls, and were perfectly sound, and so we really hated to remove them. 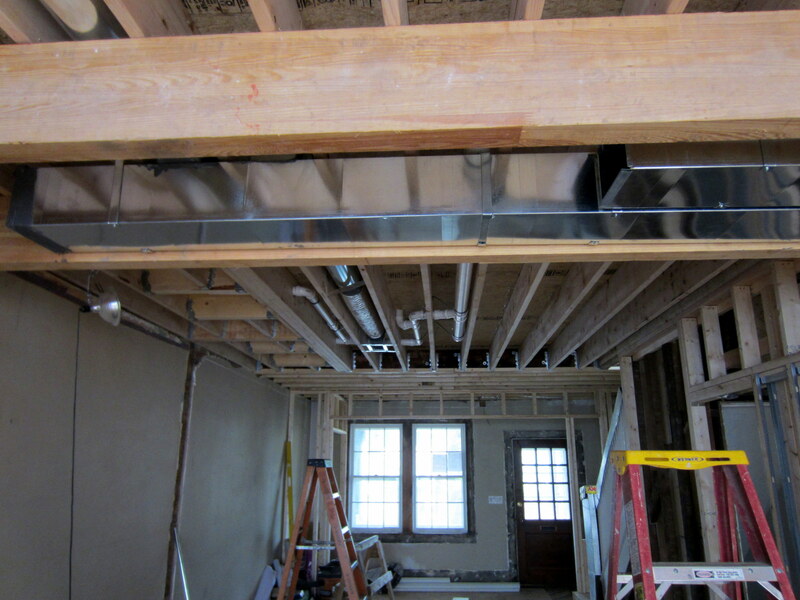 However, the 1925 joists ran in an east-west orientation (from side to side in the house, rather than front to back). To route house infrastructure elements for our open floor plan design, north-south orientation was needed. So, most of the old joists needed to go. They were replaced by the north-south oriented 2x10s that were supported by strategically placed glulam beams. The one area not affected by the new framing was the floor under most of the guest room at the front of the house. There’s no plumbing there (although there will by hydronic supply and return pipes supporting a radiator, as you’ll see), and we were able to develop a workaround to route the AC supply vents there (https://wolfestreetproject.com/2012/04/08/we-just-need-to-vent-a-little/). As a result, leaving the original joists in place at the front of the house was a way to conserve costs (one of the precious few, we’ve come to realize). Mechanical, plumbing supply pipes (copper, not PVC . 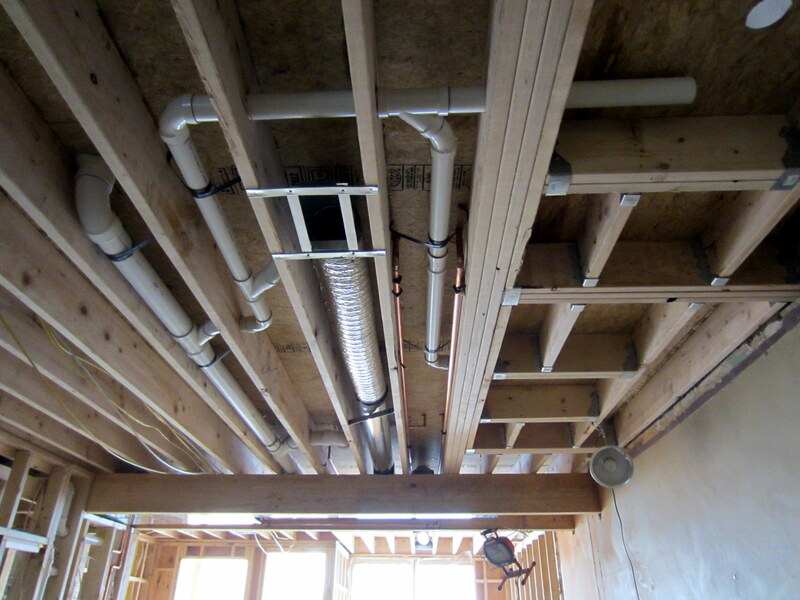 . .), plumbing drain pipes, and electrical for the second floor all needed to live somewhere, and that somewhere would be the “bays” between the new joists installed during the renovation. This post provides a Cliffs Notes version of installation of the house infrastructure elements by way of the evolving bay landscape seen from below, on the first floor. 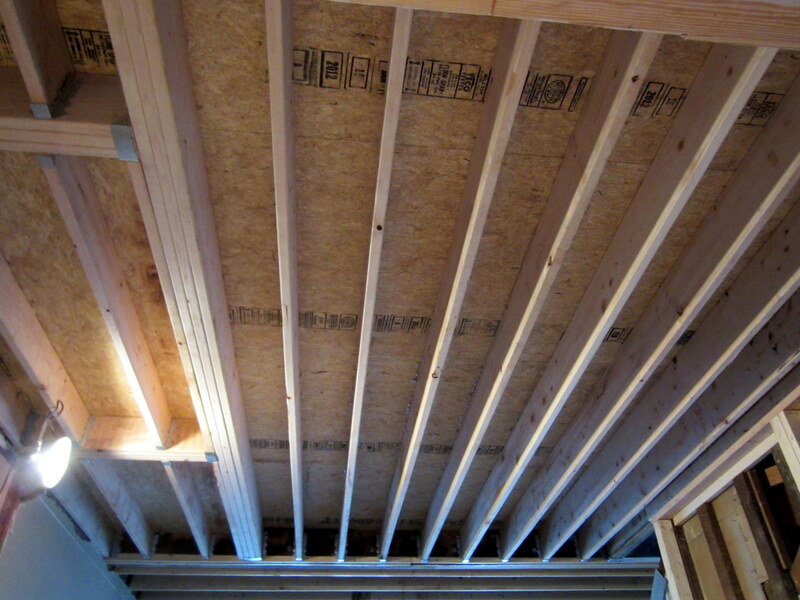 The picture below shows the joist bays after framing has been completed, but before any infrastructure elements have been installed. The triple beams and odd framing on the left side is there to support the showers on the second floor. In the picture below, elements of the mechanical system begin to appear. One of the vents is orphaned in a bay on the far side of the bulkhead. The vent is now connected to the AC supply line in the bulkhead, and has been joined by PVC drain lines. In this view of the bays to the south, the mechanical and drain lines have been joined by copper plumbing supply lines. 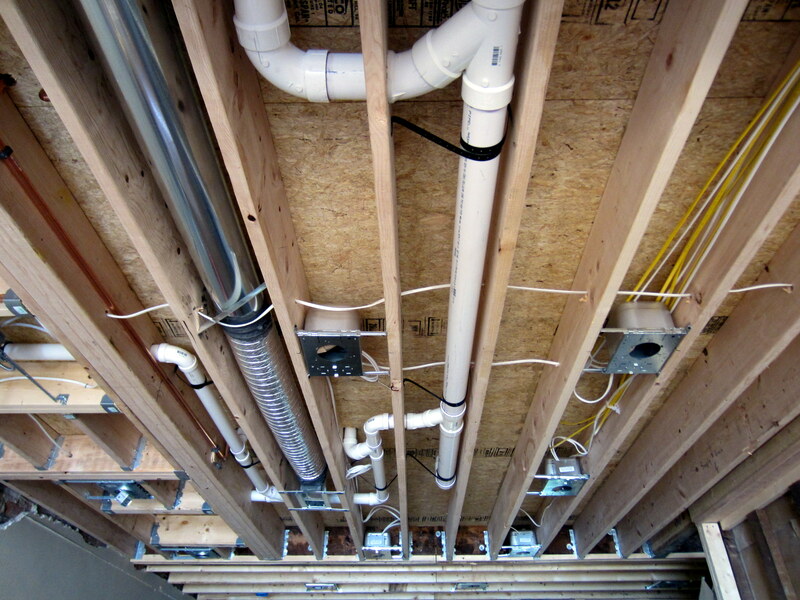 Note the framing to the right – the original beam arrangement had to be removed and reconstructed after the plumber started doing his thing, and they realized it would not allow pipes to be routed properly. Electrical has now joined the other elements at this stage. And what’s the electrical for? Among other things, the recessed lighting in this area, which has been installed at the point this picture was taken. The rearrangement of framing under the showers also solved a lighting design issue. With the original framing, we were not able to install lights in the locations called out by the plan. 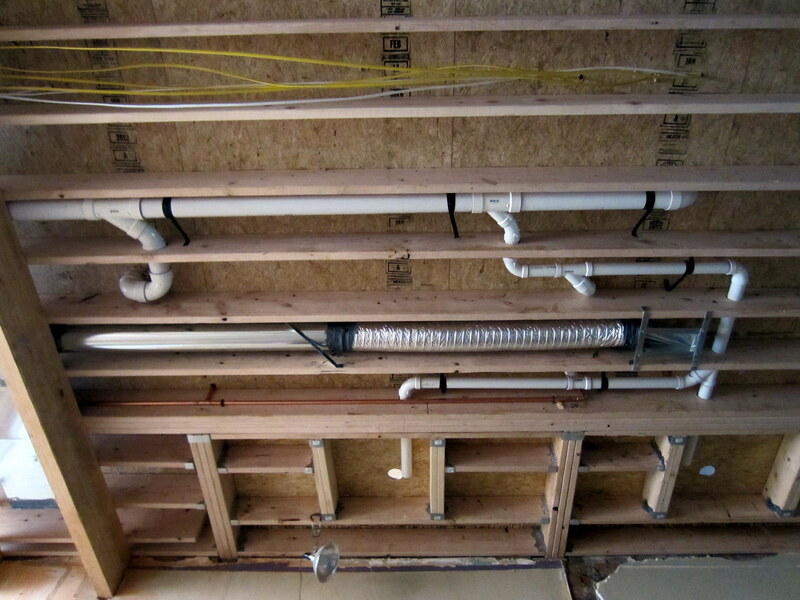 With the new framing, this obstacle was removed, and both plumbing and lighting could be implemented correctly.